Imagine that one sunny day You look at wooden floor and see it was all covered with scratches by the couch and chairs. 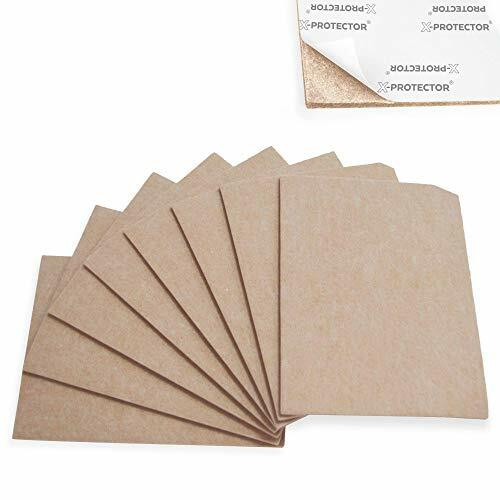 8 HEAVY DUTY 1/5" FELT SHEETS 8" x 6" BEIGE COLOR. You can cut out pads of ANY FORM/SIZES YOU NEED for any type of chair legs, furniture feet and other home items. Our nice beige color will fit to all Your furniture and interior. ✌ FORGET ABOUT SCRATCHES! Furniture felt pads X-PROTECTOR® - best protection for Your wooden, laminate or tiled flooring in Your lovely home. Our furniture coasters create shield between floor and furniture, desks & tabletops, which carefully protect surface from scratches and scuffs. ✌ X-PROTECTOR® 8 THICK HEAVY DUTY 8"x6"x1/5" BEIGE FELT SHEETS. Your chairs has round legs, recliners has big square legs and Your couch needs a special size? CUT SIZES YOU NEED of felt floor protectors for ALL Your furniture. ✌ X-PROTECTOR® SIUTABLE FOR ANY HOME FURNITURE ESPECIALY HEAVY - our wood floor protectors are perfect for any type of chair legs, furniture feet and other home furniture. CUT & STICK felts to furniture feet - and You will move ANY FURNITURE without any damages and scratches to Your floor! ✌ X-PROTECTOR® STRONG MATERIAL AND TENACIOUS ADHESIVE! Our furniture pads are made of strong eco-friendly material with recycled fibers. Tenacious adhesive guaranteed You can easy stick it to any furniture surface and be sure it will hold on and protect for a long time. If you have any questions about this product by X-Protector, contact us by completing and submitting the form below. If you are looking for a specif part number, please include it with your message.